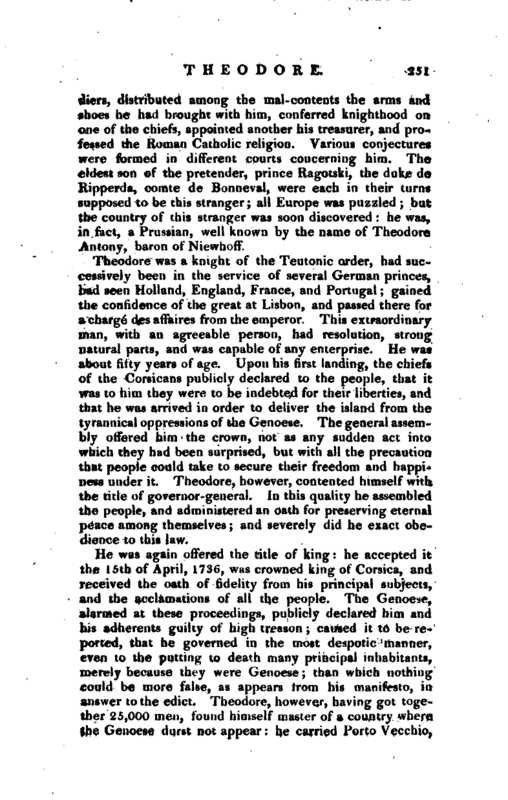 WORDS: BIOG: Theodore, Anthony I.
king of Corsica, baron Niewhoff, grandee of Spain, baron of England, peer of France, baron of the holy empire, prince of the Papal throne for thus he styled himself; “a man whose claim to royalty,” says lord Orford, “was as indisputable, as the most ancient titles to any monarchy can pretend to be;” was born at Metz about 1696. The particulars of his eventful history are thus related. In March 1736, whilst the Corsican mal-contents were sitting in council, an English vessel from Tunis, with a passport from our consul there, arrived at a port then in the possession of the roal-contents. A stranger on board this vessel, who had the appearance of a person of distinction, no sooner went on shore, but was received with singular honours by the principal persons, who saluted him with the titles of excellency, and viceroy of Corsica. His attendants consisted of two officers, a secretary, a chaplain, a few domestics and Morocco slaves. 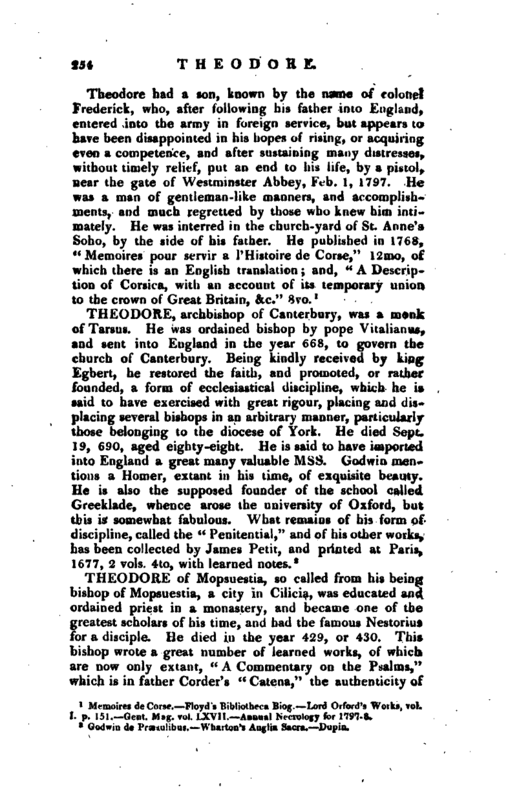 He was conducted to the bishop’s palace; called Himself lord Theodore; whilst the chiefs knew more about him than they thought convenient to declare. From the vessel that brought him were debarked ten pieces of cannon, 4000 fire-locks, 3000 pair of shoes, a great quantity of provisions, and coin to the amount o 200,000 ducats. Two pieces of cannon were placed before his door, and he had 400 soldiers posted for his guard, He created officers, formed twenty-four companies of | soldiers, distributed among the mal-contents the arms and shoes he had brought with him, conferred knighthood on one of the chiefs, appointed another his treasurer, and professed the Roman Catholic religion. Various conjectures were formed in different courts concerning him. The eldest son of the pretender, prince Ragotski, the duke de Ripperda, comte de Bonneval, were each in their turns supposed to be this stranger; all Europe was puzzled but the country of this stranger vas soon discovered he was, in fact, a Prussian, well known by the name of Theodore Antony, baron of Niewhoff. Theodore was a knight of the Teutonic order, had successively been in the service of several German princes, had seen Holland, England, France, and Portugal; gained the confidence of the great at Lisbon, and passed there for a chargé des affaires from the emperor. This extraordinary man, with an agreeable person, had resolution, strong natural parts, and was capable of any enterprise. He was about fifty years of age. Upon his first landing, the chiefs of the Corsicans publicly declared to the people, that it was to him they were to be indebted for their liberties, and that he was arrived in order to deliver the island from the tyrannical oppressions of the Genoese. The general assembly offered him the crown, not as any sudden act into which they had been surprised, but with all the precaution that people coujd take to secure their freedom and happiness under it. Theodore, however, contented himself with the title of governor-general. In this quality he assembled the people, and administered an oath for preserving eternal peace among themselves; and severely did he exact obedience to this law. He was again offered the title of king: he accepted it the 15th of April, 1736, was crowned king of Corsica, and received the oath of fidelity from his principal subjects, and the acclamations of all the people. 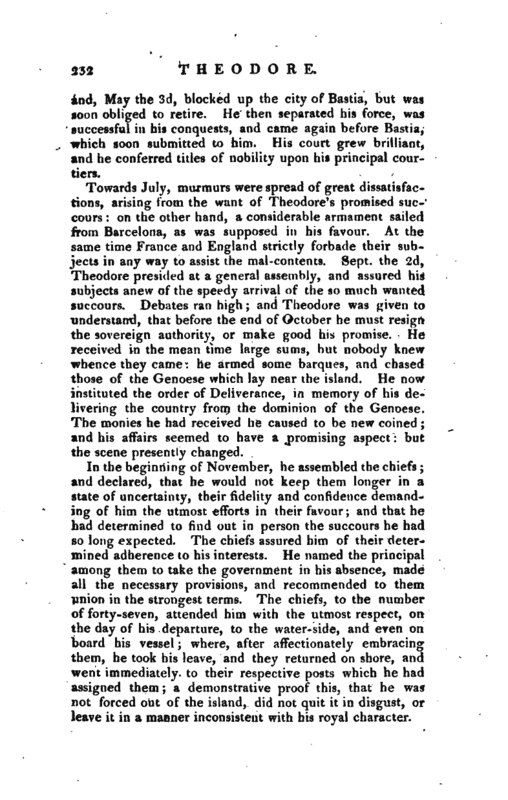 The Genoese, alarmed at these proceedings, publicly declared him and his adherents guilty of high treason; caused it to be reported, that he governed in the most despotic manner, even to the putting to death many principal inhabitants, merely because they were Genoese; than which nothing could be more false, as appears from his manifesto, in answer to the edict. Theodore, however, having got together 25,000 men, found himself master of a country where the Genoese durst not appear he carried Porto Vecchio, | and, May the 3d, blocked up the city of Bastia, but was soon obliged to retire. He then separated his force, was successful in his conquests, and came again before Bastia, which soon submitted to him. His court grew brilliant, and he conferred titles of nobility upon his principal courtiers. Towards July, murmurs were spread of great dissatisfac^ tions, arising from the want of Theodore’s promised succours: on the other hand, a considerable armament sailed from Barcelona, as was supposed in his favour. At the same time France and England strictly forbade their subjects in any way to assist the mal-contents. Sept. the 2d, Theodore presided at a general assembly, and assured his subjects anew of the speedy arrival of the so much wanted succours. Dt-bates ran high; and Theodore was given to understand, that before the end of October he must resign the sovereign authority, or make good his promise. He received in the mean time large sums, but nobody knew whence they came: he armed some barques, and chased those of the Genoese which lay near the island. He now instituted the order of Deliverance, in memory of his delivering the country from the dominion of the Genoese. The monies he had received he caused to be new coined; and his affairs seemed to have a promising aspect: but the scene presently changed. In the beginning of November, he assembled the chiefs; and declared, that he would not keep them longer in a state of uncertainty, their fidelity and confidence demanding of him the utmost efforts in their favour; and that he had determined to find out in person the succours he had so long expected. The chiefs assured him of their determined adherence to his interests. He named the principal among them to take the government in his absence, made all the necessary provisions, and recommended to them union in the strongest terms. The chiefs, to the number of forty-seven, attended him with the utmost respect, on the day of his departure, to the water-side, and even on board his vessel; where, after affectionately embracing them, he took his leave, and they returned on shore, and went immediately to their respective posts which he had assigned them; a demonstrative proof this, that he was not forced out of the island, did not quit it in disgust, or leave it in a manner inconsistent with his royal character. | Thus ended the reign of Theodore, who arrived in a few days disguised in the habit of an abbé at Livonia, and thence, after a short stay, conveyed himself nobody knew whither. The next year, however, he appeared at Paris; was ordered to depart the kingdom in forty-eight hours; precipitately embarked at Rouen, and arrived at Amsterdam, attended by four Italian domestics; took up his quarters at an inn; and there two citizens arrested him, on a claim of 16,000 florins. But he soon obtained a protection, and found some merchants, who engaged to furnish him with a great quantity of ammunition for his faithful islanders. He accordingly went on board a frigate of fifty-two guns, and 150 men; but was soon afterwards seized at Naples in the house of the Dutch consul, and sent prisoner to the fortress of Cueta. This unhappy king, whose courage had raised him to a throne, not by a succession of bloody acts, but by the free choice of an oppressed nation, for many years struggled with fortune; and left no means untried, which policy could attempt, to recover his crown. At length he chose for his retirement this country, where he might enjoy that liberty, which he had so vainly endeavoured to fix to his Corsicans: but his situation here, by degrees, grew wretched; and he was reduced so low, as to be several years before his death, a prisoner for debt in the King’s-bench. for the use of his creditors. Heroes and beggars, galjey slaves, and kings. Bestow‘d a kingdom, and deny’d him bread. 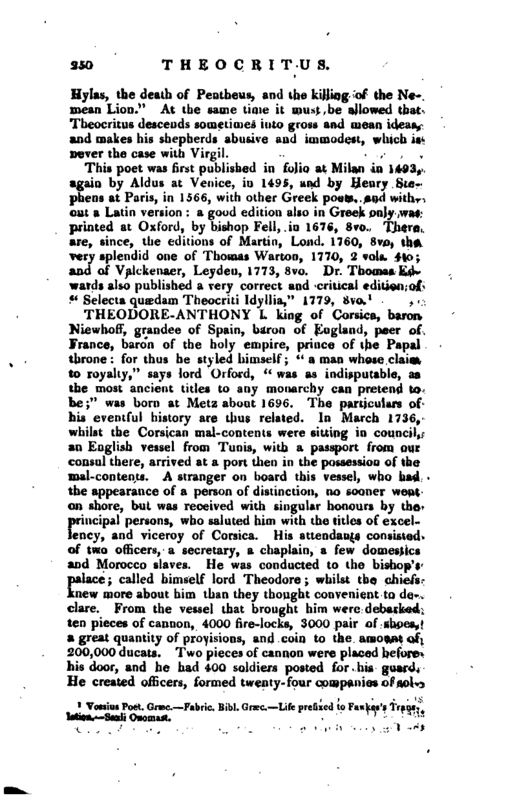 Memoires de Corse.—Floyd’s Bibliotheca Biog.—Lord Orford’s Works, vol. I. p. 151.—Gent. Mag. vol. 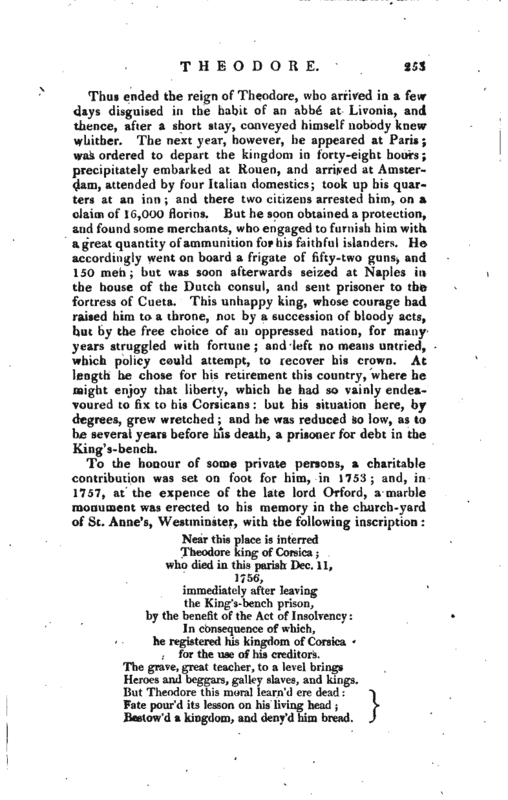 LXVII.—Annual Necrology for 1797-8.